I have long admired David duChemin’s photography and his fabulous blog, Pixelated Image. He is a world-class traveler, photographer, and humanitarian. David duChemin’s philosophy and images are akin to Ansel Adams, as their work is primarily concerned about the aesthetic vision and depth of the final photograph. A recent blog post by duChemin was about avoiding the art of seduction in photography. His quote that has become my latest mantra from that post, “Don’t allow yourself to be seduced by your subject matter. A beautiful scene isn’t necessarily a beautiful photograph.” Many photographers, myself included, have been seduced by subject matter that does not neccesarily translate into a strong photograph. 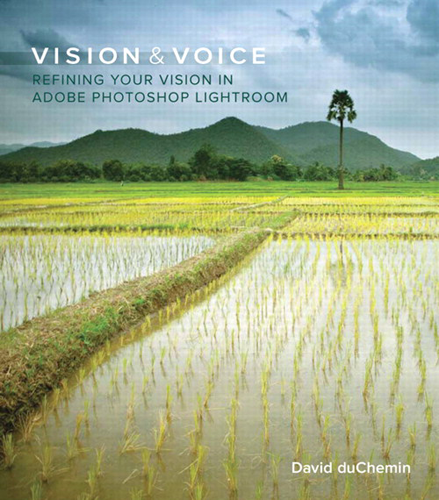 The author’s book, Vision & Voice: Refining Your Vision in Adobe Photoshop Lightroom is as much a testament to duChemin’s artistic philosophy as it is about the application Adobe Photoshop Lightroom. David duChemin uses the word vision a lot in this book. An entire chapter is devoted to crafting a vision-driven workflow and its principles. In the overcrowded world of how-to photography books, this book is refreshing. Too often books delve in to the soup- and -nuts approach of how to make a photograph exactly like a famous photographer. It is very apparent that duChemin cares more about his readers refining their artistic and photographic voice. He discusses in detail about his process and the Develop module of Lightroom. There are many different tools in this module and he explains each one in relation to a specific photograph. I found this fundamental approach to be very insightful. His explanations are more about how to enhance the mood of the photograph than a complicated photographic recipe. The adjustments are fairly simple and well-explained. He does not discuss the other modules of Adobe Photoshop Lightroom. This book is written for the intermediate or advanced digital photographer who has a working knowledge of Adobe Photoshop Lightroom and experience with RAW file formats. The intention and aesthetic of the image begins with the RAW file. The author explains about the consciousness of the digital capture. There are five principles that duChemin proposes when you capture and review images. They are: Identify Intention, Minimize Distractions, Maximize Mood, Draw the Eye, and Prepare for Output. His writing style is conversational and honest. He tells his readers what has and has not worked for him, in capture, editing, and adjusting photographs. The final chapter of the book is titled 20 Visions, 20 Voices. This 156 page chapter is more than simply eye candy or a portfolio of the author’s photography. Not only does duChemin explain in detail his particular vision for an image; he includes the photographic steps using Lightroom. This is reminiscent of Ansel Adams’ The Making of Forty Photographs. Both artists explain how important it is to refine the photograph to evoke the emotional context of a particular scene. David duChemin’s images of people and landscapes never feel posed or artificial. There is a dignity and intimacy to his portraits of people living in impoverished conditions. The examples that the author chose are quite compelling and I found myself hoping to see a future exhibition of his work. This book is highly recommended for photographers seeking to refine their voice and style. This is not a Lightroom tutorial. There are no overblown HDR (High Dynamic Range), cookie cutter, or special filter effects here. The adjustments are subtle and polished. If you are familiar with Adobe Photoshop Lightroom and seek a unique vision for your photography, this book will have a place in your library.